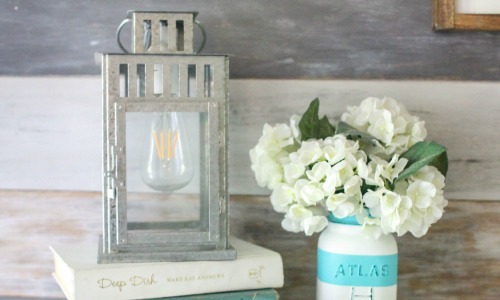 DIY Industrial Light: An Upcycled Lighting Project - Lovely Etc. After years of living without any overhead lighting in our living room, we finally had an electrician add wiring for a light fixture. Such a good decision. Then the search was on for the perfect fixture. I found several lights I loved but they were all way over the budget – so I decided to make my own. 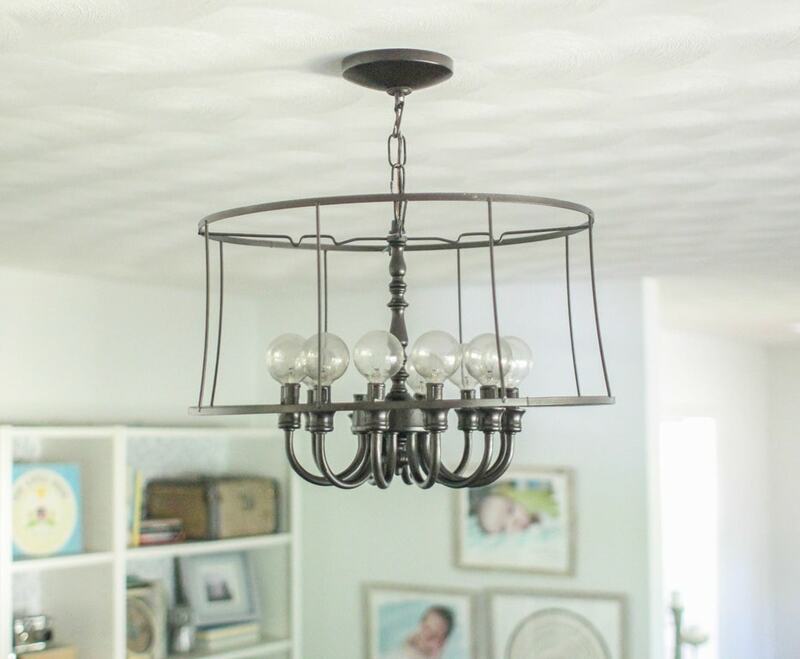 This DIY industrial light fixture cost only $20 and was incredibly easy to make. And best of all, I can’t even tell you how excited I am that we finally have a light! 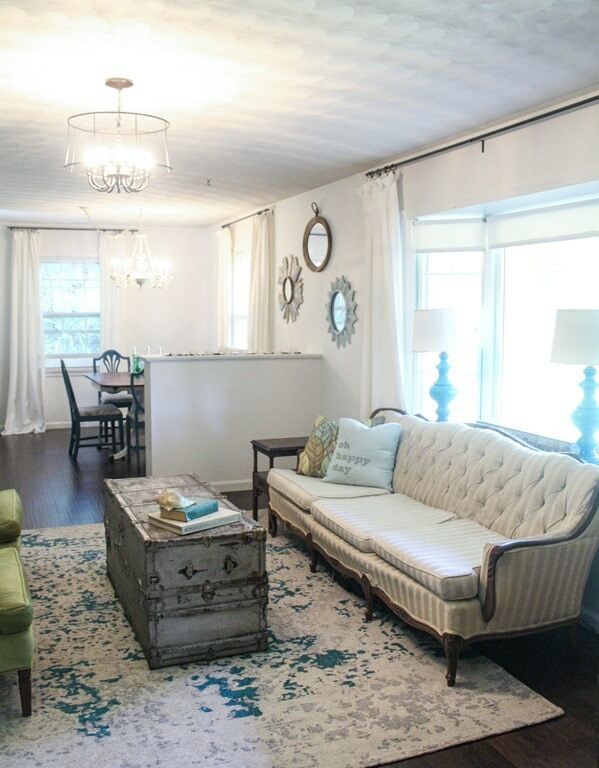 I started with this huge brass and gold light fixture I found at the Habitat ReStore for $15. (Man that thing was heavy!) 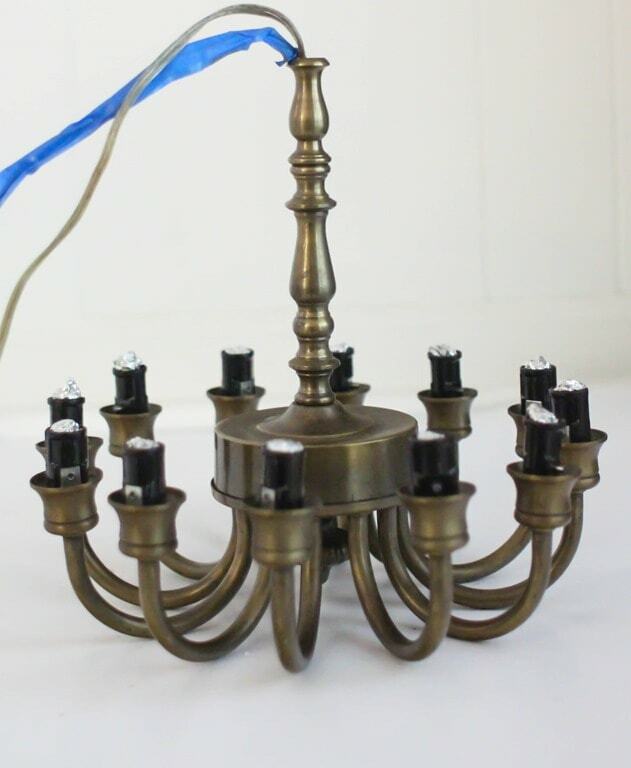 These old brass lights are pretty common and there were several there for me to choose from that day. This one was the winner because I liked the curved shape of the inside portion. Once I got it home, I started taking it apart. 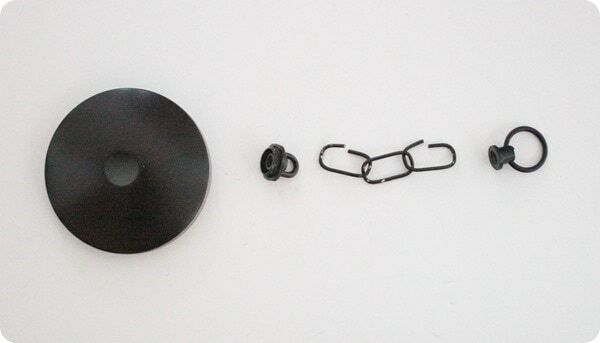 Most light fixtures and lamps are pretty easy to deconstruct just by unscrewing the various parts. Once I had stripped off the massive shade, I was left with this. The next step was spray painting the whole thing oil-rubbed bronze. To make sure that paint didn’t mess up any important electrical parts, I taped off the ground wire and used foil to protect the inside of the light sockets. Several light coats of metal primer and oil-rubbed bronze spray paint later and the light already looked completely different. I started contemplating what I wanted to use as a shade for my light. I was dreaming up all kinds of wood and metal concoctions, when I spotted this old metal lampshade in my stash of thrifted finds. It still had a few pieces of the old torn lampshade fabric attached, but I easily cut those off. All it needed was a few coats of my oil-rubbed bronze spray paint. 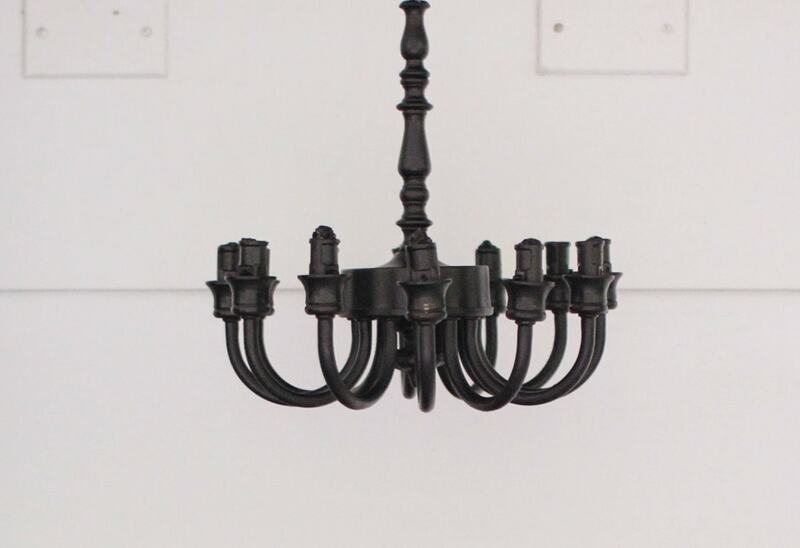 The final step was using a few small pieces of hardware to complete the top of the fixture. I used a basic light canopy kit along with a small length of chain and another ring that screwed onto the top of the fixture. 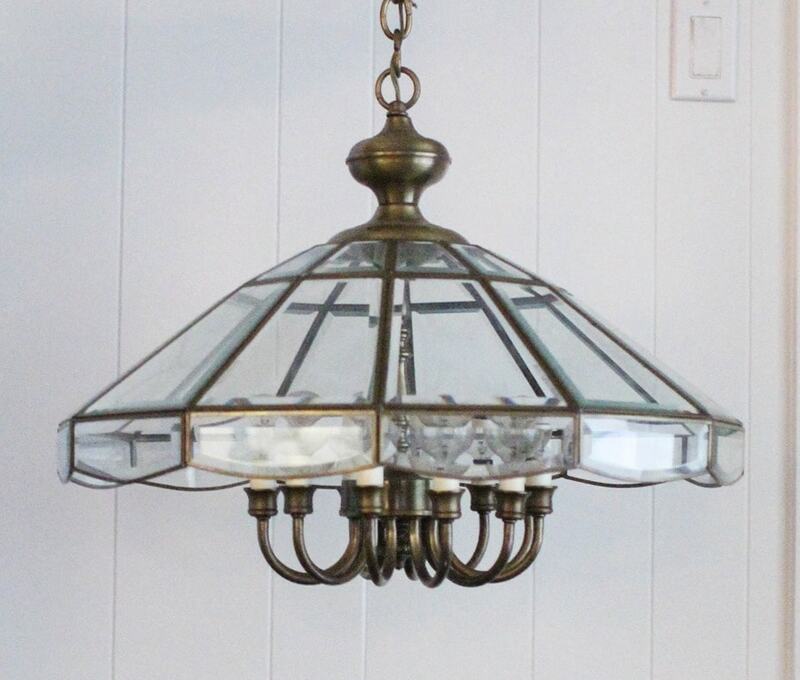 And now that old, dated brass fixture is a modern industrial ceiling light. 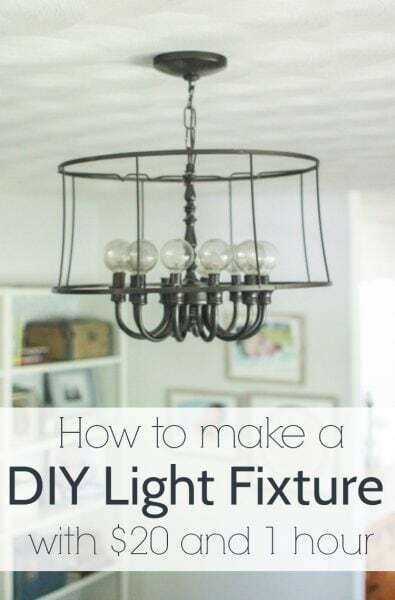 I think it would look even better with Edison bulbs, but since my fixture takes 12 light bulbs, buying new Edison bulbs would have tripled the cost of this project! So I stuck with plain incandescent bulbs for now. After so many years of relying on lamps in here, it is amazing being able to walk in and light up the whole room with the flip of a switch. I love it! Upcycled and repurposed projects are by far my favorite projects to do. I love saving something that is a little outdated with a few tweaks. 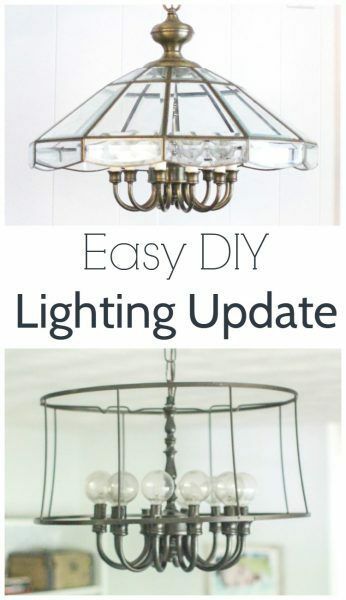 Want to see more upcycled lighting ideas? Check these out. Thanks Pat. I totally agree – sometimes you just really need more light. And I a firm believer in creating a home that works for you – not the designers! Yes – I agree that the transformed light is an improvement – however, I feel that it is not quite the correct light for your particular space. Lights should match your furniture style – but on the other hand – if you feel happy with your achievement – – why not enjoy what you have. Thanks Rita, that is what I am debating as well. 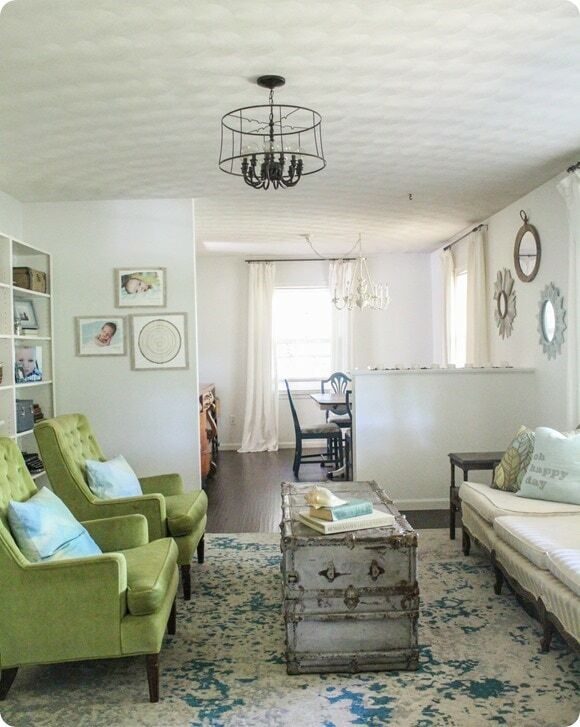 I love an eclectic mix in a room – but I’m not sure this is striking quite the right balance. Still love the light though! 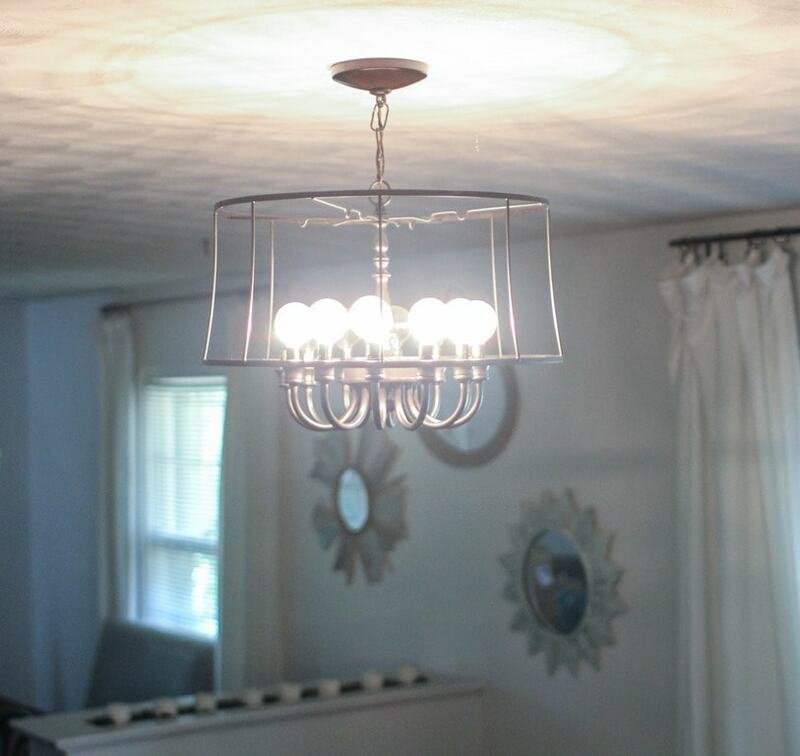 The upcycled chandelier is perfect for your space. It has the right balance of old & new ideas put together to achieve a new look. Thank you Cheryl! You are so kind. This light looks just like the newest chandeliers I have seen in the fancy stores. Good job! I have an old shade form too and now I know what to do with it. Thanks. Thanks Joan! That is what I was thinking too. Why not paint it copper? Copper accents are all the modern rage at the moment also gold and silver and these colour’s will go with any other fixtures you would have in your home. And the open shades are all the go. Good idea Lorraine, I have been thinking about adding some copper somewhere. The only comment I would give is I think if it were just a tad lower it would for your area better. Just a little more chain? Hmm, that is a good suggestion – I just want to be careful not to make it so low it is a hazard to tall people! 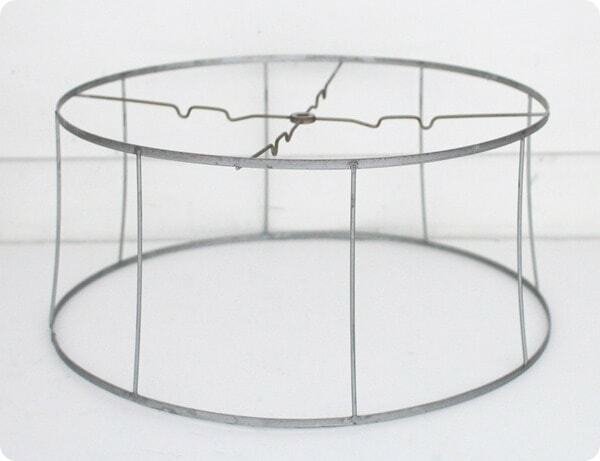 I love the look that you achieved with just using the wire from a lampshade! The room looks great! If you decide to sell it – Please let me know. I have a very modern dining room, that would fit this to a tee. 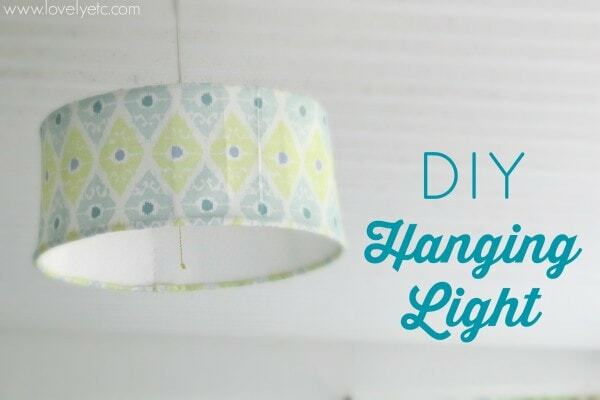 Have you considered doing a new fabric on the wire shade? 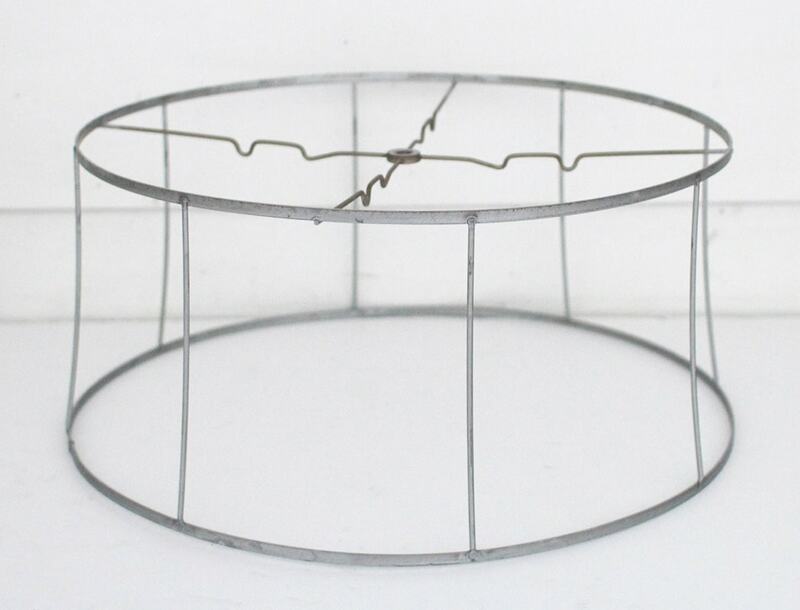 love the plain wire but it might soften it and give a less industrial feel you seem to be looking for? Thanks for the suggestion DeAnn! I agree that would definitely soften the look. I think I’ve decided to live with it this way for right now but I am filing all of these ideas away for whenever I decide I am ready for a change! Great job with creating your own light fixture! I have an old lamp shade just waiting for such a project!! !